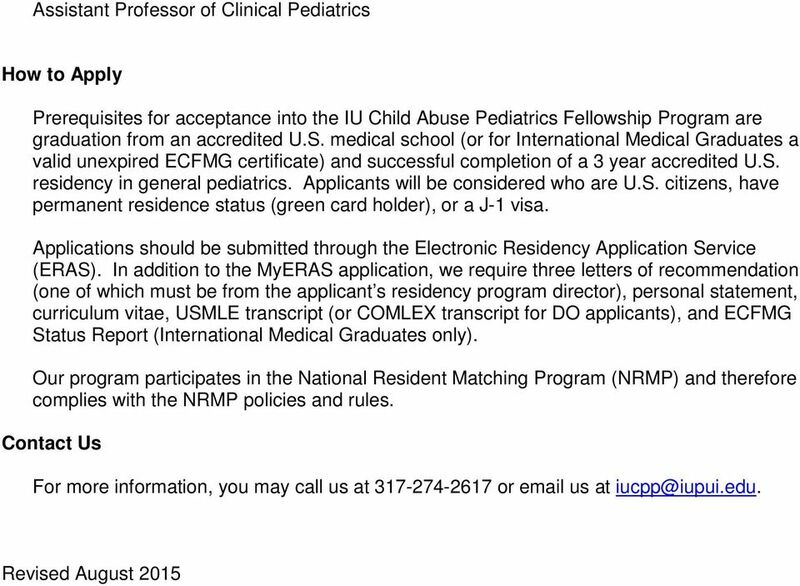 Download "Child Abuse Pediatrics Fellowship Program. Child Protection Program Indiana University School of Medicine Riley Hospital for Children"
2 suspected abusive head trauma. In 2013 this program was expanded to include cases involving fractures and burns in children less than 3 years of age. 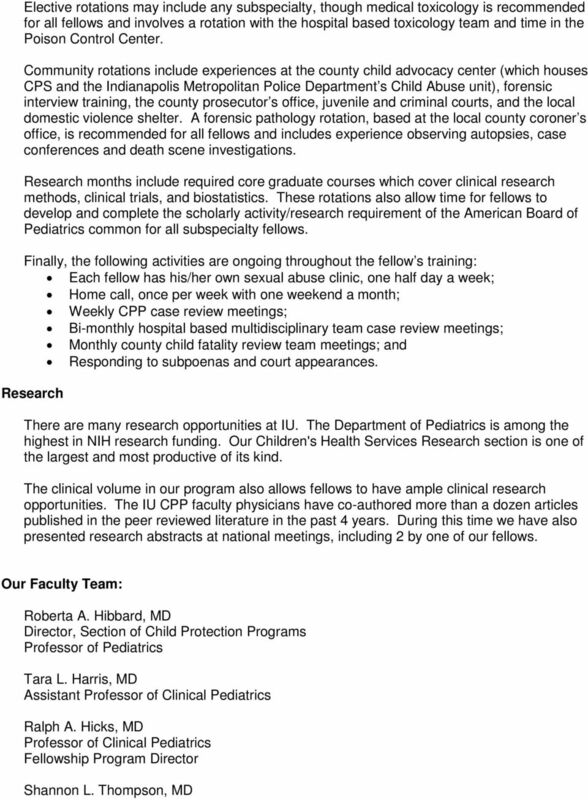 The goal of the PEDS Program is to provide expert knowledge from child abuse pediatricians in order to assist case managers in differentiating abusive injuries, accidental injuries and medical conditions. The Pediatric Center of Hope (child sexual abuse clinic) provides comprehensive medical evaluation for children alleged to have been sexually abused. Services are provided by pediatricians with expertise in child abuse, pediatric sexual abuse nurse examiners and pediatric social workers. Children are referred primarily by CPS, law enforcement, and health care providers. Both scheduled and acute examinations (many of the latter involving forensic evidence collection) are performed by the physicians. Crisis Counseling Services are an extension of the Pediatric Center of Hope and bridge the gap from the time a child is referred through the typical several weeks until formal ongoing counseling is available. This program serves children and families in person and over the phone. Follow up is provided for children examined in the Pediatric Center of Hope. Consultation is also provided for children and families not actually seen in our programs at the medical center, as well as to community professionals. This program has served a tremendous need in providing support to families in the early stages of an allegation and investigation when there is much turmoil and families are not sure where to turn. Over 1500 families have received these services annually. 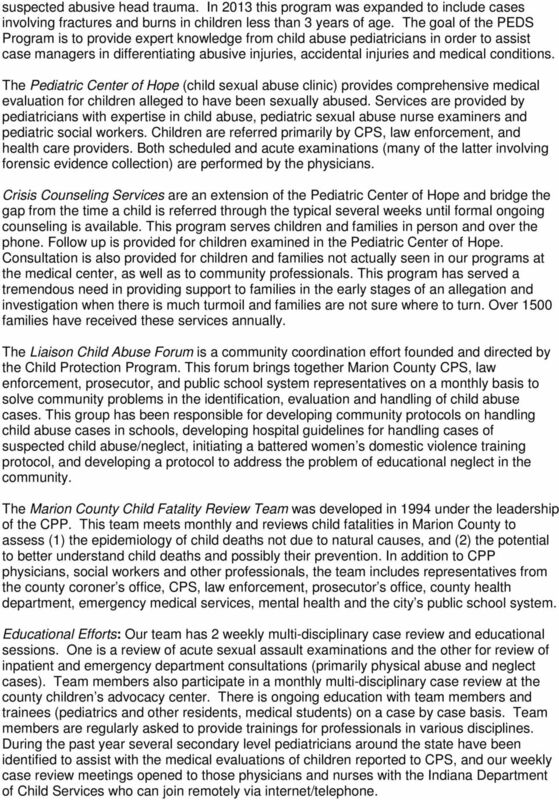 The Liaison Child Abuse Forum is a community coordination effort founded and directed by the Child Protection Program. This forum brings together Marion County CPS, law enforcement, prosecutor, and public school system representatives on a monthly basis to solve community problems in the identification, evaluation and handling of child abuse cases. This group has been responsible for developing community protocols on handling child abuse cases in schools, developing hospital guidelines for handling cases of suspected child abuse/neglect, initiating a battered women s domestic violence training protocol, and developing a protocol to address the problem of educational neglect in the community. The Marion County Child Fatality Review Team was developed in 1994 under the leadership of the CPP. This team meets monthly and reviews child fatalities in Marion County to assess (1) the epidemiology of child deaths not due to natural causes, and (2) the potential to better understand child deaths and possibly their prevention. In addition to CPP physicians, social workers and other professionals, the team includes representatives from the county coroner s office, CPS, law enforcement, prosecutor s office, county health department, emergency medical services, mental health and the city s public school system. Educational Efforts: Our team has 2 weekly multi-disciplinary case review and educational sessions. One is a review of acute sexual assault examinations and the other for review of inpatient and emergency department consultations (primarily physical abuse and neglect cases). Team members also participate in a monthly multi-disciplinary case review at the county children s advocacy center. There is ongoing education with team members and trainees (pediatrics and other residents, medical students) on a case by case basis. Team members are regularly asked to provide trainings for professionals in various disciplines. During the past year several secondary level pediatricians around the state have been identified to assist with the medical evaluations of children reported to CPS, and our weekly case review meetings opened to those physicians and nurses with the Indiana Department of Child Services who can join remotely via internet/telephone. 3 Goals and Objectives The overall educational goals for the fellowship program are to provide fellows with the background knowledge, clinical and research experience necessary to allow them to deliver optimal care to the potentially abused child; and to qualify fellows for child abuse pediatrics subspecialty board certification by the American Board of Pediatrics. General goals, each with specific objectives, are listed below according to the six ACGME core clinical competencies: 1. 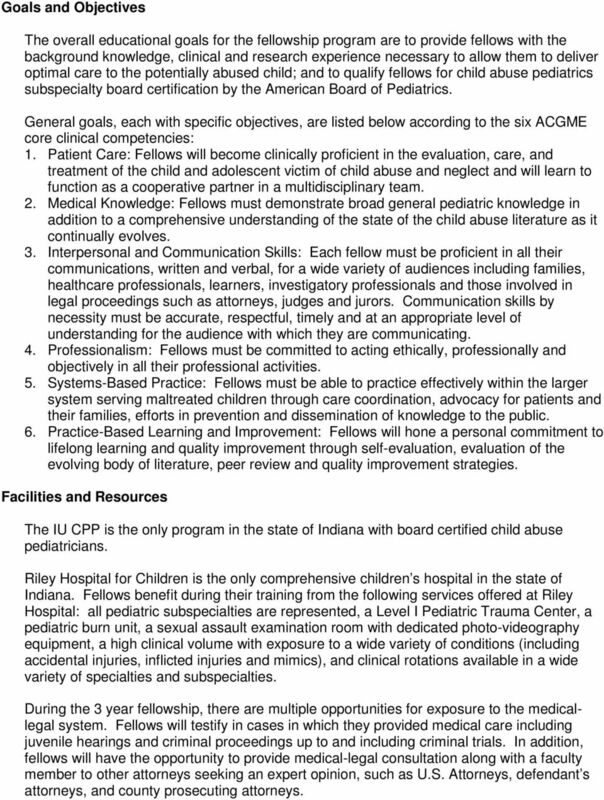 Patient Care: Fellows will become clinically proficient in the evaluation, care, and treatment of the child and adolescent victim of child abuse and neglect and will learn to function as a cooperative partner in a multidisciplinary team. 2. Medical Knowledge: Fellows must demonstrate broad general pediatric knowledge in addition to a comprehensive understanding of the state of the child abuse literature as it continually evolves. 3. Interpersonal and Communication Skills: Each fellow must be proficient in all their communications, written and verbal, for a wide variety of audiences including families, healthcare professionals, learners, investigatory professionals and those involved in legal proceedings such as attorneys, judges and jurors. Communication skills by necessity must be accurate, respectful, timely and at an appropriate level of understanding for the audience with which they are communicating. 4. Professionalism: Fellows must be committed to acting ethically, professionally and objectively in all their professional activities. 5. Systems-Based Practice: Fellows must be able to practice effectively within the larger system serving maltreated children through care coordination, advocacy for patients and their families, efforts in prevention and dissemination of knowledge to the public. 6. Practice-Based Learning and Improvement: Fellows will hone a personal commitment to lifelong learning and quality improvement through self-evaluation, evaluation of the evolving body of literature, peer review and quality improvement strategies. 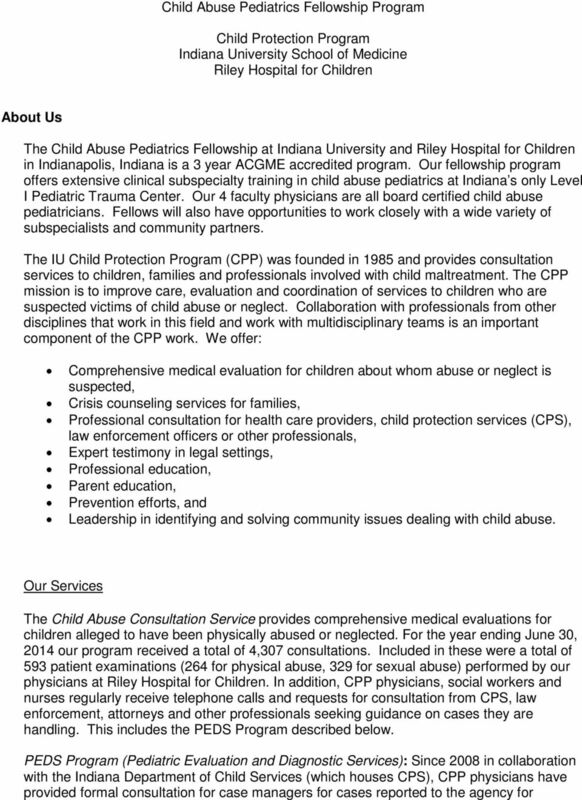 Facilities and Resources The IU CPP is the only program in the state of Indiana with board certified child abuse pediatricians. Riley Hospital for Children is the only comprehensive children s hospital in the state of Indiana. Fellows benefit during their training from the following services offered at Riley Hospital: all pediatric subspecialties are represented, a Level I Pediatric Trauma Center, a pediatric burn unit, a sexual assault examination room with dedicated photo-videography equipment, a high clinical volume with exposure to a wide variety of conditions (including accidental injuries, inflicted injuries and mimics), and clinical rotations available in a wide variety of specialties and subspecialties. During the 3 year fellowship, there are multiple opportunities for exposure to the medicallegal system. Fellows will testify in cases in which they provided medical care including juvenile hearings and criminal proceedings up to and including criminal trials. In addition, fellows will have the opportunity to provide medical-legal consultation along with a faculty member to other attorneys seeking an expert opinion, such as U.S. Attorneys, defendant s attorneys, and county prosecuting attorneys. 4 Fellows have learning opportunities with diverse child abuse pediatric groups. We routinely participate in teleconferences with child abuse pediatrics programs in other parts of the country. These conferences include journal clubs, fellow conferences and multi-center research studies. Research opportunities include a wide variety of clinical and pediatric health services research in a university setting with an already existing infrastructure. Graduate degree opportunities are available. Fellows may combine this core course work with additional courses to allow for the completion of a master s degree (examples include clinical research, public health and ethics). 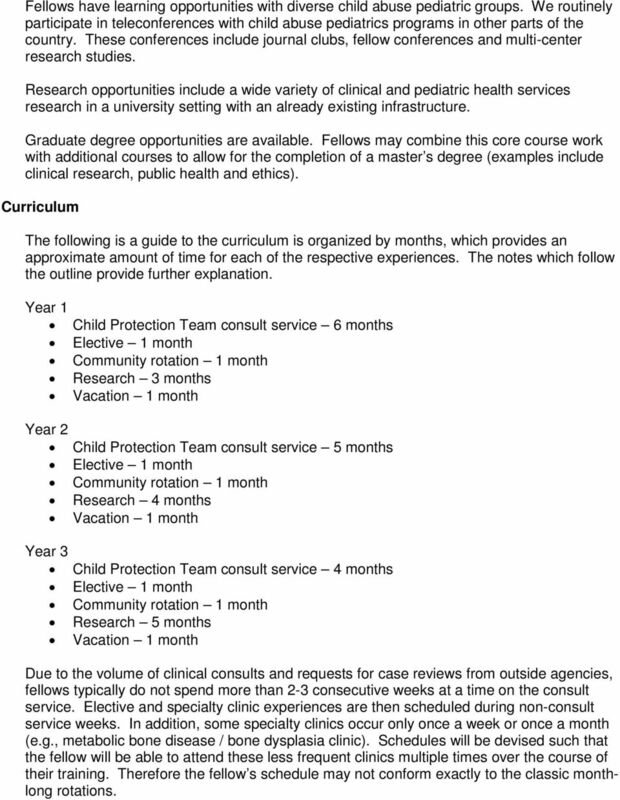 Curriculum The following is a guide to the curriculum is organized by months, which provides an approximate amount of time for each of the respective experiences. The notes which follow the outline provide further explanation. Year 1 Child Protection Team consult service 6 months Elective 1 month Community rotation 1 month Research 3 months Vacation 1 month Year 2 Child Protection Team consult service 5 months Elective 1 month Community rotation 1 month Research 4 months Vacation 1 month Year 3 Child Protection Team consult service 4 months Elective 1 month Community rotation 1 month Research 5 months Vacation 1 month Due to the volume of clinical consults and requests for case reviews from outside agencies, fellows typically do not spend more than 2-3 consecutive weeks at a time on the consult service. Elective and specialty clinic experiences are then scheduled during non-consult service weeks. In addition, some specialty clinics occur only once a week or once a month (e.g., metabolic bone disease / bone dysplasia clinic). Schedules will be devised such that the fellow will be able to attend these less frequent clinics multiple times over the course of their training. Therefore the fellow s schedule may not conform exactly to the classic monthlong rotations. Special Topics Goals and Objectives 1. Forensic Psychiatric Evaluation To be capable of performing a competent comprehensive forensic psychiatric evaluation whether it is a civil dispute or criminal matter. Objectives: Perform thorough assessment, and design and implement care plans on 12 or more seriously mentally ill addicted persons. MANDATED REPORTING OF CHILD NEGLECT OR PHYSICAL OR SEXUAL ABUSE 214. A. Child means a person under age 18.